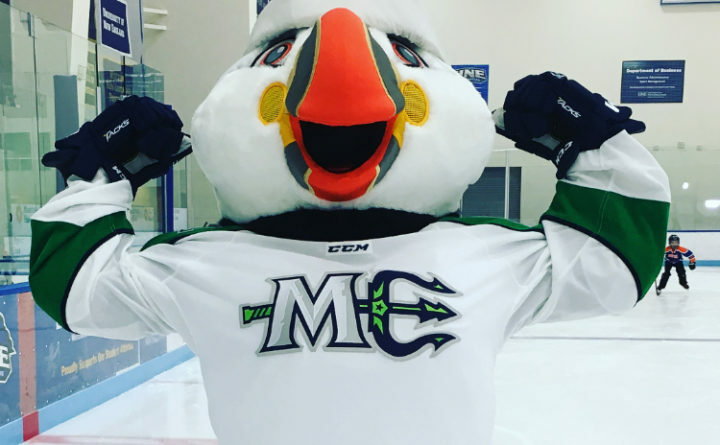 Beacon, the puffin mascot for the Maine Mariners pro hockey team that starts its season Oct. 13 with a home opener at Portland's Cross Insurance Agena against the Adirondack Thunder. As temperatures dipped Monday across the state, Maine’s new pro ice hockey team started selling single game tickets on Sept. 10. The Maine Mariners expect a big opening night on Saturday, Oct. 13, when they play at home against the Adirondack Thunder, said Adam Goldberg, vice president of business operations for the ECHL team. “We’ve sold 50 percent of the capacity for opening night,” he said. The arena holds 6,300 fans. While Goldberg said fans will come mostly from within a 15-mile radius of Portland, he also expects fans from Bangor, Lewiston-Auburn and Portsmouth, New Hampshire, who attended games of Maine’s former American Hockey League team, the Portland Pirates. The ticket figure includes earlier sales of 700-750 full season ticket packages for the 72 total games, 36 of which are at home. Season rickets run from $756 for front row seats to $576 in the center and $468 in the end sections. The team also sold 75 five-game plans for $100. The plans include the opening game and four other games. And it sold about 100 10-game flex packs that go for $170 to $190, depending on the seat locations. Goldberg said the team doesn’t know yet what to expect in terms of ticket and merchandise sales. The Mariners replace the former Portland Pirates, who moved to Springfield, Massachusetts, in 2016. The team will start training camp Oct. 1. The games will include special promotions and events. Every Friday will include $1 hot dogs, $2 popcorn and a $3 16-ounce Bud Light $3 until the start of the second period. And the puffin mascot, Beacon, will provide entertainment for the kids. The throwback nights include the team wearing “Wild Blueberries” shirts to honor the second choice of a team name among fans. Goldberg also shared some trivia: 10,000 gallons of water is used to build the ice surface. Those lyrics from Bob Marley’s song “Coming in from the cold” held true in Maine’s lobster industry this week, when data about live lobster exports were released. Exports of live lobsters to China from Maine plummeted in July, the same month China imposed 25 percent retaliatory tariffs against the United States in an escalating trade war between the two economic superpowers. But Canadians are snapping up live Maine lobsters, buying $43.72 million worth in July, more than double in that same month last year. Amazon CEO Jeff Bezos said Thursday that the online retailer would reveal the location of its second headquarters by the end of this year from a list of 20 finalist cities. He made the announcement at the Economic Club in Washington, D.C., Thursday night, according to The Hill. Scarborough and Brunswick were early casualties in the race to become Amazon’s second headquarters, but Boston still is in the running. Some 238 cities offered tax and other incentives to draw in what Amazon has said will be a more than $5 billion investment in the headquarters. It expects to have 50,000 workers making an average of $100,000 a year. The U.S. financial system and the economy are far stronger than they were in the the fall of 2008, when the recession struck, according to an Associated Press analysis. In August of this year, 65,335 people filed for personal bankruptcy compared to 88,663 in September 2008. The median household income rose from $58,000 in 2008 to $61,372 in 2017. And homes in foreclosure fell from 81,312 in September of 2008 to 60,000 this July. The prime interest rate in September 2008 and this month is the same at 5 percent.